It's rare I drink a cider, as I'm more of a beer kind of guy. It's even rarer that I drink a dry cider, as I usually prefer sweeter ciders. 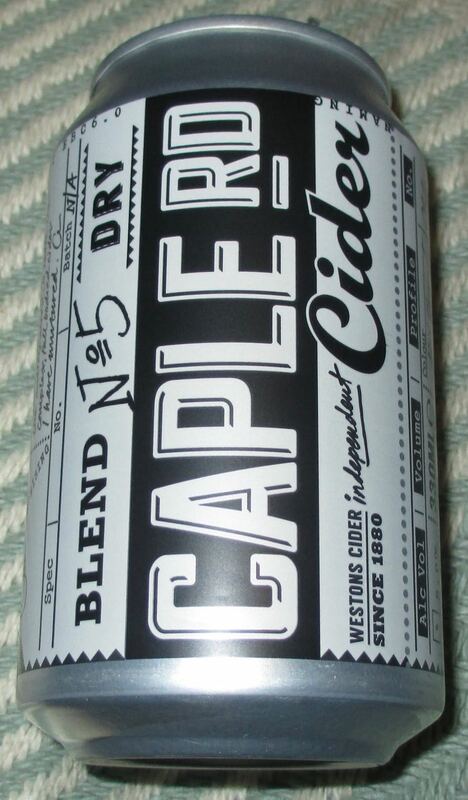 This Caple Rd dry cider was produced by Weston & Sons, in Herfordshire, who were established in 1880. It was very kindly sent to us from the online supermarket Degusta within a box of treats. We've been very lucky to have three of these boxes so far and are still sifting through the Foodstufffinds' possibilities. It's been a fairly hot and damp day here, and after a long trip to the gym and whilst watching the rain drip down from the grey sky, a dry cider suddenly appealed. There was a pleasant fizz on opening the can and that familiar fermented cider apples smell. This golden almost amber dry cider filled my waiting beer glass excitedly. I say "beer glass", but it doesn't always have beer in it, often soft drinks and this time cider. On first taste I was quickly reminded about the difference between dry and sweet ciders. Fresh pressed apples, double filtered and slowly fermented with the finest yeast over an eighteen month maturation period, this cider smacks the tastebuds with it's dry bitterness from the outset. There is complex flavours here however, as there isn't just bitterness, there's sweetness moving into the aftertaste and left to linger. Leaving me wanting to pick up the glass for another hearty swig!